From October 13, 2018, to April 4, 2019, UCCA presents “After Nature,” the inaugural exhibition at the UCCA Dune Art Museum, the newest addition to UCCA’s growing portfolio of projects. Included are works by nine Chinese artists who span a range of generations, born between 1942 and 1988. The works on display, by Li Shan, Liang Shaoji, Liu Yujia, Nabuqi, Yang Xinguang, Trevor Yeung, Yu Ji, Zheng Bo, and Zhuang Hui & Dan’er, engage with the question of how humanity discovered—and in some ways invented—the natural world, a question given increased urgency by the release of a United Nations Intergovernmental Panel on Climate Change report this week forecasting climate-induced crises before 2040 if carbon emissions continue at current levels. 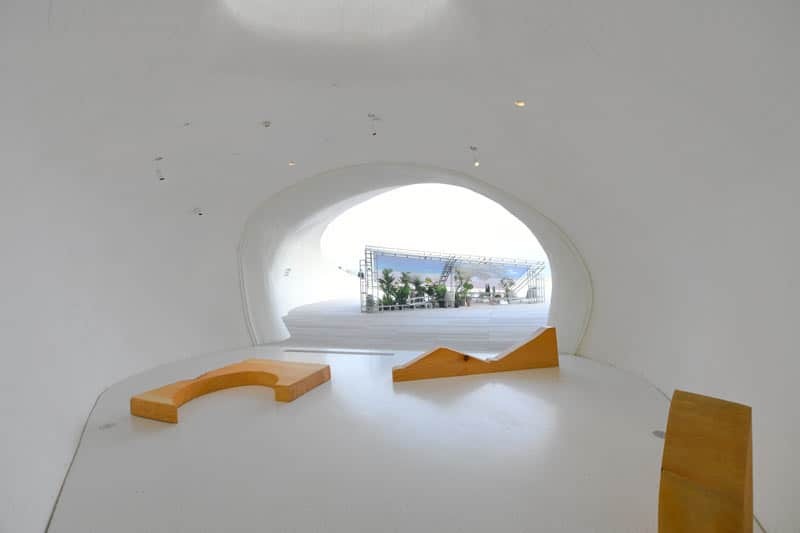 The exhibition is specifically devised for the singular spaces of UCCA Dune Art Museum, a subterranean building designed by Li Hu and Huang Wenqing of OPEN Architecture, located under a sand dune on a beach in the Aranya Gold Coast Community, 300 kilometers from Beijing. Organized by UCCA curator Luan Shixuan, the exhibition creates a dialogue among the works, the cell-like galleries that house them, the surrounding sand, and the rising sea just beyond. The title “After Nature” denotes changes in both the physical environment and human conceptions of it. Sustained human encroachment has permanently transformed the environment, leading many scholars to declare an entirely new geological era, the Anthropocene. The Romantic idea of nature as unspoiled wilderness—always ideologically fraught, even spurious—is no longer tenable. With this comes the realization that nature is not a holistic entity or some secular providence, but simply the multiple, overlapping worlds fashioned by the billions of beings—living and non-living, organic and non-organic—that reside on this earth. Works in the exhibition testify to this strange insight. They evoke received notions of nature such as scenic mountains, green plants, and flowing rivers, only to have them morph seamlessly into “artificial” elements like liquid crystal, plastic, and inkjet printing. Taken together, the artists and works ask viewers to rethink nature, rather than to do away with it; to imagine a new ecology that sees humans and objects in close proximity, mutually influencing and influenced, ineluctably entangled. Three works by Li Shan (b. 1942, Heilongjiang Province) deal with bioengineering: the prints Scribble 2 and Scribble 3 depict strange, organic hybrids of corn, decomposed leaves, and other organic material, while his film Misfortune centers on a dragonfly-human hybrid, roving across the world where an ecological disaster—with its attendant genetic mutations—seems to have already occurred. Moon Garden by Liang Shaoji (b. 1945, Shanghai) continues the artist’s engagement with the life cycle of silkworms. A frame of acrylic and steel is covered in silk and cocoons, testifying to the ways in which actors—human and animal—engineer the places we inhabit. Alongside the installation, a film documents the silkworms spinning on this installation. Buried in the sand, itself taken from the surrounding area, are fragments of daggers, scimitars, and mirrors, which, along with the steel-like monument, evoke the rise and fall of ancient Mesopotamian civilizations, as well as the region’s present-day turmoil. The exhibition includes two films by Liu Yujia (b. 1981, Sichuan Province). Black Ocean is inspired by Italo Calvino’s Invisible Cities, which follows an imaginary dialogue between Marco Polo and Kublai Khan on a series of fantastical cities. Wave transforms aerial footage of beaches into a mesmerizing, digital diptych. These abstracted, aestheticized images of nature both contrast and resonate with the liquid crystal display screens that make them visible, seemingly pointing to an uncanny synthesis of two forms of liquidity. Destination by Nabuqi (b. 1984, Inner Mongolia Province) juxtaposes “fake” plants with an image of a scenic beachside getaway, reminiscent of a billboard. The work reminds viewers of the dunes and sea outside the building, effacing the differences between interior and exterior by showing how artwork and environment are both shaped by human hands. Mountains by Yang Xinguang (b. 1980, Hunan Province) is a collection of small, concrete hills. Yang is interested in the symbiosis between organic and synthetic materials. Here, it is concrete, a quintessential urban material, that is modeled into hills, revealing the sand, water, and gravel that have comprised it all along. Monochrome prints of an acanthus tree by Trevor Yeung (b. 1988, Guangdong Province) pose the question: what becomes of the plant in the age of mechanical reproduction? The acanthus provides an ironic case study—a plant replicated in European art and architecture for thousands of years and disseminated around the world via colonial encroachment, yet which few people have seen in person. Yeung’s works Island 5050 and Island 6090, meanwhile, are “2.5-dimensional” sculptures: both are prints of bodies of water, stuck to pieces of real pumice. Ta Jama – Green Hair Monster by Yu Ji (b. 1985, Shanghai) is an exercise in naming. What appears to be small boulders overgrown with moss are actually made of reinforced concrete. Reminiscent of a Chinese garden, the work reflects Yu’s interest in the many roles the figure of the stone plays in different civilizations and religions. The sleight-of-hand substitution of manmade for natural material, and the imitative, speculative quality of the work, only further blur the distinction between the natural and artificial. Dune Botanical Garden by Zheng Bo (b. 1974, Beijing) takes the psammophyte—a plant that is uniquely adapted to living in shifting sands with its roots uncovered—and situates it within the environment of UCCA Dune. By transplanting a garden into a museum, Bo seeks to shift the definition of art from something “manmade” to something made by all living things. The “Leftover Material from the Carpenters” series, by Zhuang Hui (b. 1963, Gansu Province) and Dan’er (b. 1983, Shaanxi Province) gives viewers a sense of the radical power of framing. These painstakingly crafted sculptures look like wooden odds and ends left over from a carpentry project. Yet composed of copper and acrylic—materials that are cast, not carved—they complicate the easy binaries between artist and artisan, carpenter and conceptualist. UCCA Dune is an art museum buried under a sand dune by the Bohai Sea in Beidaihe, 300 kilometers east of Beijing. Designed by OPEN Architecture, its galleries unfold over a series of cell-like spaces that evoke caves. Some are naturally lit from above, while others open out onto the beach. As a branch of UCCA, China’s leading independent institution of contemporary art, it presents rotating exhibitions in dialogue with its particular site and space. UCCA Dune is built and supported by UCCA strategic partner Aranya, and located within the Aranya Gold Coast Community.